Quartz is one of the best materials for use in kitchen worktops and has a number of advantages over natural stones such as granite. Quartz is an old German word meaning “hard”. After felspar it is the most common material in the earth’s crust and when used for kitchen worktops it is mined and then crushed to a powder and mixed with 7% resin and colourings to produce the final article. A quartz worktop is as hard as granite and cleans like glass. It has similar looks to granite, but being non-porous is a huge advantage in the kitchen. All granite surfaces are porous and can stain if spills and splashes are left on them for too long. In particular, beetroot juice, red wine, butter, oils, vinegar and lemon juice can all stain granite where quartz will shrug them off as though nothing has ever happened. Quartz is also heat resistant. 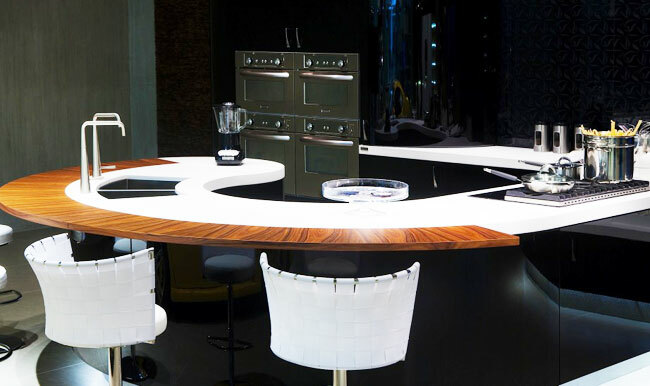 There are many manufacturers of quartz worktops but two of the best known are Silestone and Zodiaq. A few years ago Silestone invested some two and a half million dollars for advertising at the US Superbowl on television and became the number one producer. It is available in some 3,500 stores in the US today, but Zodiaq is not too far behind. Between the two of them these manufacturers have created worktops in a vast range of designs and colours and Silestone even has one finish that gives a “leather” effect. Other well-known brands include Samsung, Caesarstone, Cimstone and Compac. Here in the UK one of the very big advantages of quartz worktops is that they are usually guaranteed for ten years; some suppliers will even extend this to fifteen years. By comparison, granite often has no guarantee whatsoever. Quartz is heat resistant to the extent that putting hot pans down on it straight from the hob or cooker will have no effect, although it is always advised to use a trivet or hot pad. Equally, it will not chip or scratch if you chop vegetables or other foods directly on the surface; you will damage the knife blade long before the quartz worktop and for this reason it is better to use a wooden chopping board. Because of its non-porosity quartz is extremely hygienic. There are no cracks or crevices in which bacteria or other germs can hide and multiply. It is also a cold material so is very good for rolling out pastry or dough needing only a quick wipe down with a damp cloth afterwards. Another big advantage in the kitchen is that quartz, because it is non-porous, will never need resealing. Other surfaces such as marble, granite and limestone are all porous and need regular resealing but quartz does not. Furthermore, it is regarded as “green” since it emits no radon gas. Materials like quartz do emit a small amount of radon but quartz will not. As regards price, quartz worktops will generally be in the same bracket as granite. It has to be said that quartz probably does not have the same depth of shine that granite does, but in fact many customers prefer quartz for that reason. In order to get a no-obligation quote for your quartz worktop simply complete our online form and we will rush one out to you straight away. One of the great advantages of a quartz worktop in your kitchen is that because of its properties there is very little required in the way of maintenance. It is totally non-porous and extremely hard which means that, unlike granite or marble, it will never need resealing. Marble and granite are both 100% natural materials and are cut out of the ground in slabs after which they are cut to size and polished. Being completely natural they have certain flaws which is not the case with quartz. After felspar, quartz is the most common material in the earth’s crust and is mined; it is a natural mineral but when used for kitchen worktops (and some other applications) it is ground to a powder and then mixed with resins and colouring. The resulting material is 93% quartz and 7% resin. It is a very hard material (in fact the word “quartz” is German and means hard or tough) measuring 7 on the Mohs scale; diamond, which is the hardest known material measures 10. As a result quartz is not only non-porous but will not harbour germs or bacteria on its surface, nor can moulds grow on it. It is very difficult to scratch or chip it – not impossible, but very unlikely unless you hit it with a hammer. Dropping a cast iron pan from a height might just chip it, but probably not. With either a granite or marble worktop, while they are very beautiful to look at, there can be problems. Not the least of these is staining. They are likely to suffer stains from a number of foods and liquids, especially butter, hot cooking oils, red wine, beetroot juice, lemon juice and vinegar among others. In a hard water area simply leaving water on the surface of a granite worktop can cause it to stain. Obviously any spills should be wiped up as quickly as possible from surfaces such as these, but it is easy to get distracted by a visitor at the door or even not notice a spill in the first instance. With quartz you have none of these problems. Any spills or splashes will simply sit there until you get around to wiping them up. By and large, cleaning your quartz worktop involves no more than wiping with a damp cloth and drying with a tea towel or kitchen towel. Anything that is dried on, such as egg yolk for example, can be removed with a scourer or an abrasive liquid cleaner since it won’t damage the surface as it would on other materials. There are many different types of materials used in the construction of kitchen worktops but of them all quartz is probably the easiest to look after. In fact, it pretty much looks after itself. As it is a cold material it is excellent for rolling out pastry and dough. Simply wipe off the residue with a damp cloth or paper kitchen towel and then wipe dry with another paper towel or soft cloth. Given a little common sense and some TLC your quartz worktop will probably last as long as your house.